As we enter into the spring season, the warmth of the weather and the symbolism of growth is stirring all kinds of good things in me. The perennial flowers are blooming and evenings are lengthening and I just want to grow, like them. Physically experiencing spring's growth sparks something inwardly in me. My apathy has been awakened & I am growing akin to living, instead of growing comfortable with existing. As the exterior world whispers "grow" to my interior, one of the major focus points of growth for me has been paying more attention to my well-being. I'm not sure if being "healthy" (mentally, physically, spiritually) comes natural to anybody really, but if it does, I missed that gene. I am an expert at mastering one category while neglecting the other. As an outsider, this habit of mine could look endearing, like when I'm so busy reading a book I forget to eat lunch (again). But at 4pm when I realize I've been awake since 7am and all I've ingested was a couple crackers and 2 cups of coffee...my pounding migraine does NOT feel endearing ;) I can be so enveloped in a task that I forget to do important self-care tasks, which ends up making me less productive because the next two hours are spent scouring for food, taking ibuprofen, chugging water, and massaging my eyes to make the headache go away. For some of you this may sound totally crazy. "Like hellooooo Abigail, you're a grown up. Feed yourself. Breakfast, lunch, dinner. Didn't you learn the normal meal schedule in Pre-K?". Which is totally warranted. It's time I grow up a bit in the world of balance. Past due, really. So my friends...I'm growin' up! I have begun implementing some daily habits to care for my physical and mental well being and it has truly made a world of difference. No more raging headaches. No more binge eating after skipping breakfast and lunch. No more wasting time scrolling and scrolling intaking bits of other people's lives while forgetting to live mine. This is the goal at least. I'm young in the wellness journey so I've already resolved to fumble and forget, as well as give myself permission to have leeway, like eating jalepeno cheetos (#guiltypleasure) on our road trip this weekend. Below are 5 things I suggest doing that will go a longgg way in caring for your well-being. 1. Center your mind & heart when you wake up. Stay away from scrolling through Instagram or Facebook the minute you open your eyes. It's a new day of your life and you start it by looking at other people's lives? Not too efficient in my experience. Rather, do something good for your soul. Consciously choose to center your mind and heart upon waking up. Put good things in your mind. Read a chapter of a book you've been wanting to read for months. Water your plants. Listen to good music. Be kind to your fragility by settling and centering your mind and THEN get productive. Make a to-do list. Check your email. Responded to unanswered text messages. Doing things in this order will feel much more restful than just jumping into the digital world ASAP. 2. Drink Apple Cider Vinegar first thing. Boil the water and combine with 1 tbs. of vinegar in a coffee cup. Stir in 1 tbs. of raw honey. Add a dash of cinnamon. I've been keeping my cinnamon in these New Mexico based, Hanselmann Pottery spice jars, which are awesome both visually and practically. 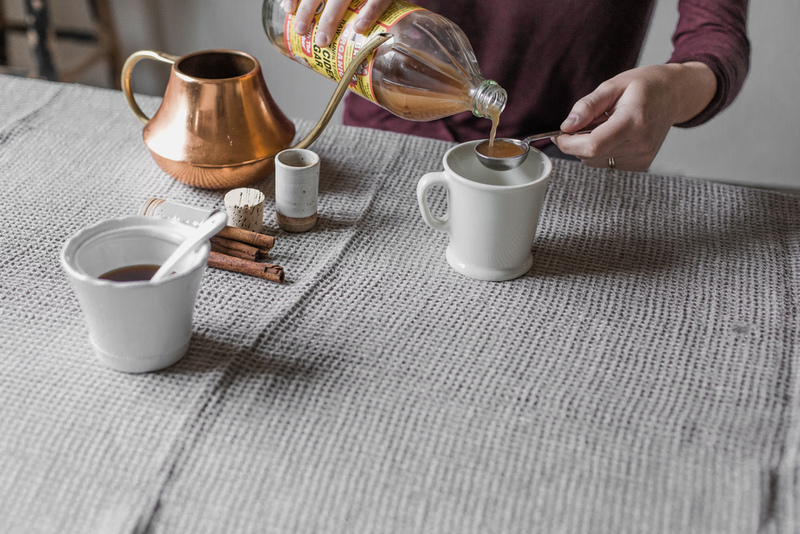 After combining the ingredients, drink immediately while warm! & the list goes on! Some people say to use it as a substitute for coffee, but I'm too big of a coffee fan to make that substitution, so I typically drink the warm ACV while brewing my coffee in the Chemex and then eat oatmeal or grapefruit 30 minutes later. Create specific gaps in your day as off-limits times for social media. Everything about the word "boundaries" makes me cringe. I'm not about them...but I am learning to be, because setting them up makes for a healthier use of time, especially if you work a job where you are on your phone and computer often, and thus have all-day access to technology. When you make your day's to-do list (as I mentioned earlier), include break times for your mind. This could include going on a walk, cleaning up a part of your house/office, or even a space to plug-in on social media. Just be mindful of the clock while you take your break of choice. I love social media for many reasons. What a gift that we can instantaneously connect with friends or strangers, all over the world! The opportunity for inspiration, encouragement, and connection is abundant and because of this, I think it has a beautiful place in our lives. But I think it will invade parts of our lives that are meant to be sacred and protected, if we don't protect our time. Too often our gut instinct when we are bored or just have lag time is to click open Instagram, Facebook, or Snapchat. Something that works for me is intentionally filling my free time with quiet time to reflect or pray, listening to informative podcasts, or calling a faraway family member or friend to catch up. 4. Drink lemon water through out your day. Lemon water is amazing for your body. It has many of the health benefits as ACV and more! What I like to do is slice up a lemon and add it to a carafe of water in the morning, and then pour myself glasses through out the day. One lemon for the pictured amount of water can be strong so feel free to dilute it a little with just regular, filtered water. This drink has especially helped my daily headaches and energy crashes. 5. Slow down at sunset. As the day is coming to an end, allow yourself to slow down. When you get home, be intentional about connecting with the people you live with—whether it be roommates, spouses, children, etc. For me personally, I don't naturally slow down when evening hits. If anything, I'm still thinking of all the things I could continue working on! I literally have to dial down my running mind in order to sit down and ask my husband how he is and truly engage/listen. 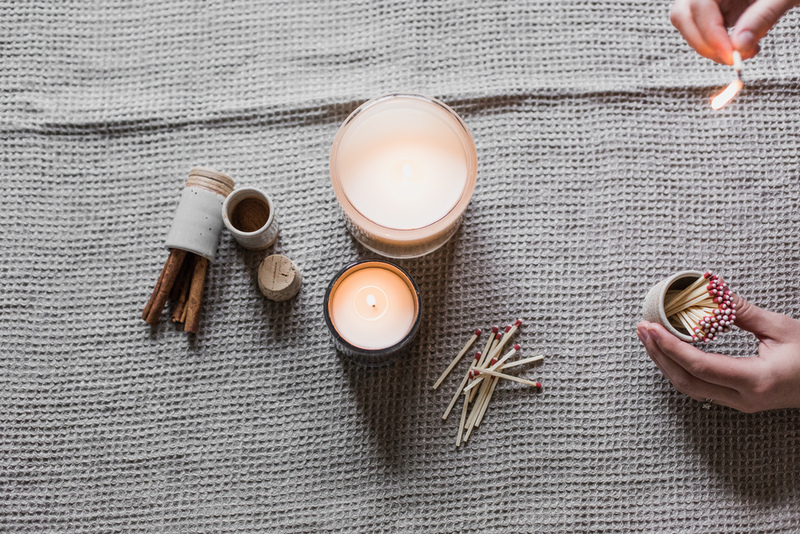 One way I love to settle in and relax for the evening is to light a candle (or two, or three). It's become a nightly tradition for us, reminding us to let the day be done and be fully present with one another. Even when we do have to work late at home, I love having candles lit in the background to set a relaxing mood. My favorite ones right now are from Alixx, which is based in Miami, Florida. 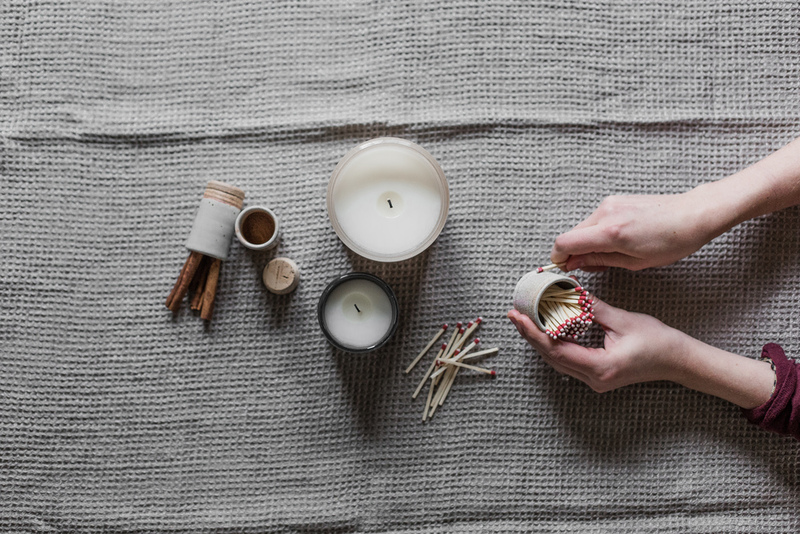 The candles are made of all natural, vegetable based wax and come in hand-blown jars made in France. I was gifted the Tea Time scent for Christmas, which has become one of my favorite candle scents ever! (That's saying lot, considering I cycle through a ton of candles) I'd also recommend Bois de Figuier which is a woody, spicy scent with cedar and fig aromas, or Bois & Encens. You can get them online here (each purchase gives 10% back to charity), or check here to find a stockist in your city. 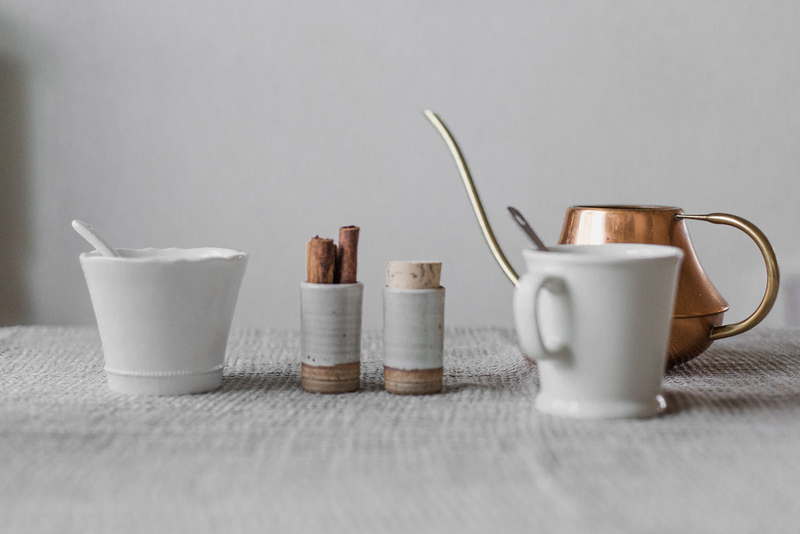 Another idea for an evening ritual is brewing a warm drink. Some friends of mine make nightly coffee together in order to unwind and unite. If the caffeine is too much, try a calming tea. Andddd that's a wrap. Cheers to wellness, Mondays, and hoping these 5 tips help you on your journey to feeling well, both physically and mentally! All images Copyright © 2017 Abigail Green.